A man in the background is working on repairing a drain spout Calle Comercio. 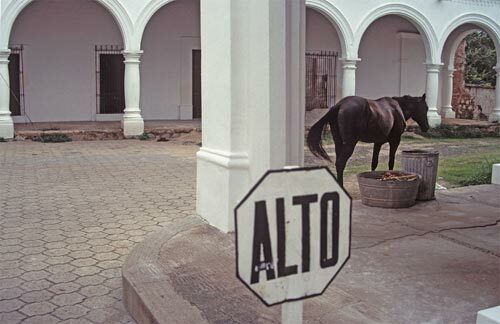 Behind the horse is the former Governor’s mansion. Why is this horse here? Because it is here. In the bigger picture the answer could be that Christopher Columbus brought the first domesticated horses on his second voyage to the new world. His expedition selected 25 horses from Andalusia including the Spanish Jennet, know for their athleticism, medium size and comfortable gait. The Spanish royal architects who laid out Centro Álamos as it is found today were also from Andalusia. The horse has found food scraps to rummage through. Food is food. While taking this photo I wondered if someone realized this horse was possibly not where this horse should be? 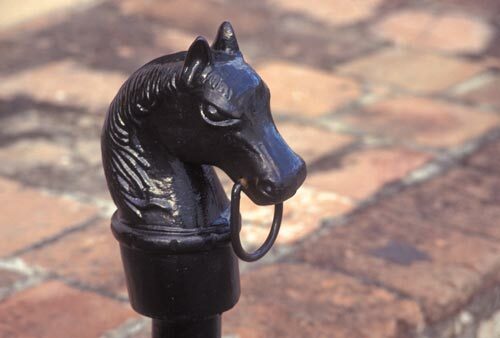 And, would they go looking for the horse or is this a regular occurrence and the horse returns unassisted? 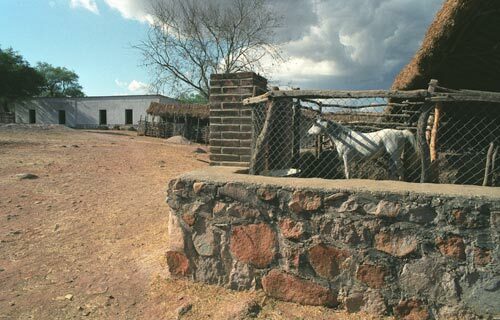 A horse on its own in Centro Álamos is not a common sight but it should not be a surprise given Álamos, Sonora, Mexico’s old west nature. Looking through the Museos' window at the old Álamos fort's front door. 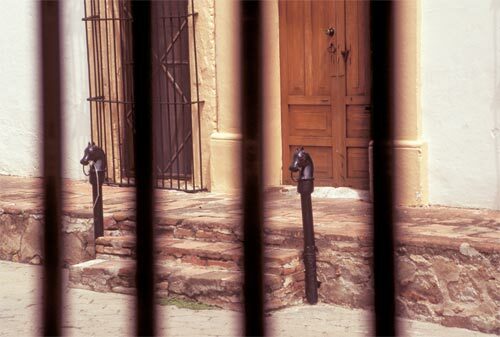 All of Centro Álamos is a museum as illustrated by looking out Museo de Costumbrista de Sonora’s northern windows and seeing La Ciudadella, one of the oldest and best kept buildings on the Plaza. This was the town’s original Spanish fort. It is said that a Spanish soldier’s ghost is here protecting hidden treasure. This ghost is not alone. There are reports of ghost throughout Centro Álamos, purchase a home and a ghost, or ghosts, come along in the deal. 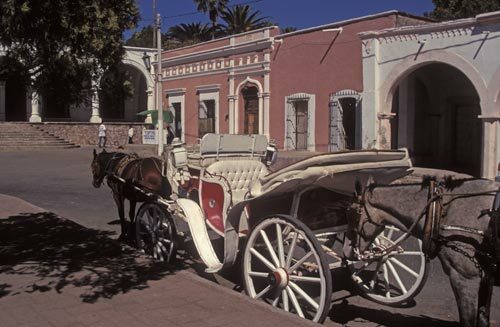 The streets of Álamos are living history. 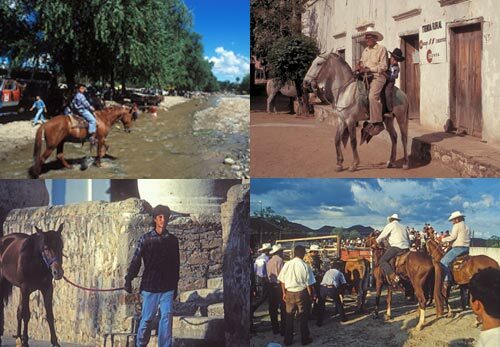 Dr. Martin Dale Edwards and Zora Tyler owned Rancho Las Crucecitas, a 15 minute walk from the Plaza, when these photos were taken in 1995. They had two large houses, with two caretaker families living in one, two barns and 23 corrals. Water was provided by an abundant well and a dam behind the main house which caught and stored runoff from Mt. Álamos. They had an Arabian breeding program that used the son of Fadjur as their primary stallion. We are not sure where Arabian horses came from: northern Syria, southern Turkey, northern edge of the Fertile Crescent, Iraq, across the Sinai, Egypt, southwestern Arabia… We do know that around 1500 B.C. records begin to appear talking of the impacts these powerful “hot blooded” Arabian horses were making. Las Crucecitas’ 175 acres was purchased from Zora by Sharon Bernard and renamed Estancia Crysalis. Frank Bernard, her father, had owned a 1200 acre ranch that was three miles northwest of Álamos and might have been named Estancia Crysalis. He was a hotelman and a former Spanish Consul to Vancouver. 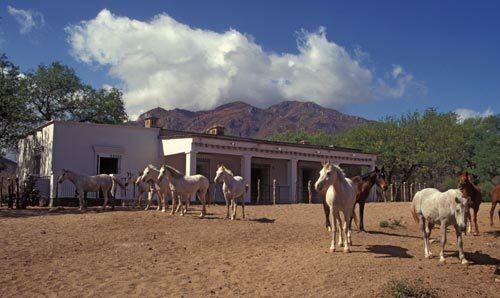 After he sold the ranch its name was changed to Rancho El Palomar. 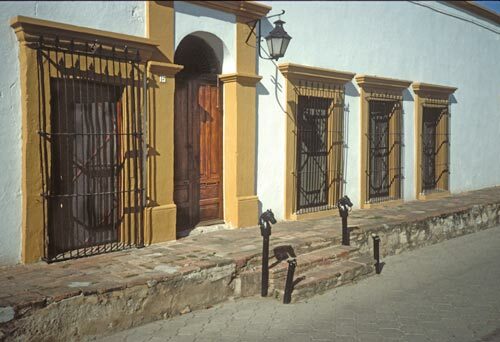 Frank, and his second wife, Atie, then purchased Calle Comercio 8, the Bishop’s mansion in Álamos Centro. I met briefly with Frank in 1993 and he told me that I had brought a talented crew to film Álamos over the Christmas holidays. Horse spirits and ghosts are everywhere. 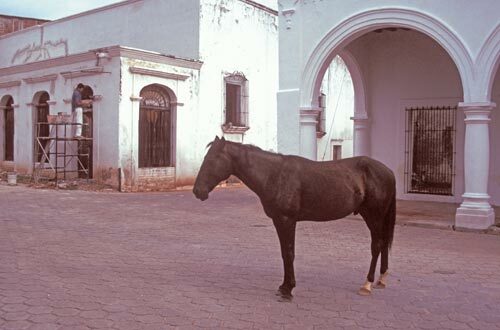 Anders, on a 1995 late Spring mid-morning, meets a horse in a vacant lot off of Calle Galiana. 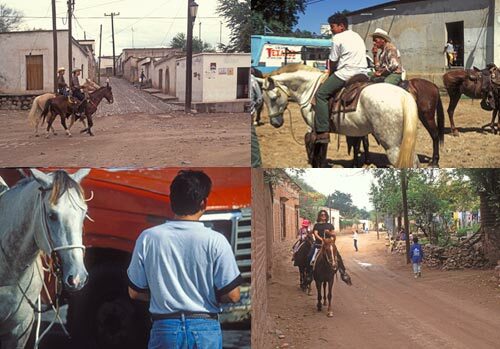 It was common to see a horse on the streets of Álamos, usually with a rider. Horse hair styling by Doug Reynolds. Video and editing by Anders Tomlinson. 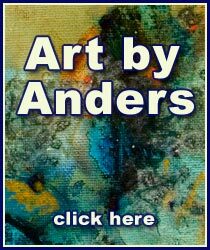 Music is an excerpt from Denver Clay’s ” Long Angel.” Produced by Anders Tomlinson and Kit Nuzum.